Patient's today approach their health care much the same way they do other services in their daily lives. In our always on, always connected world there is an expectation that patient’s can interact with their health care provider in the same way they do with their bank, an airline, grocery store or even ride sharing service. In a recent blog post Joseph Smith, M.D. writes "If our healthcare system were to implement the automation, connection and coordination that other industries have used to change the face of consumer engagement, boosting patient engagement wouldn't be an issue. We would instead be easing the burdens on the very patients we are trying to help." 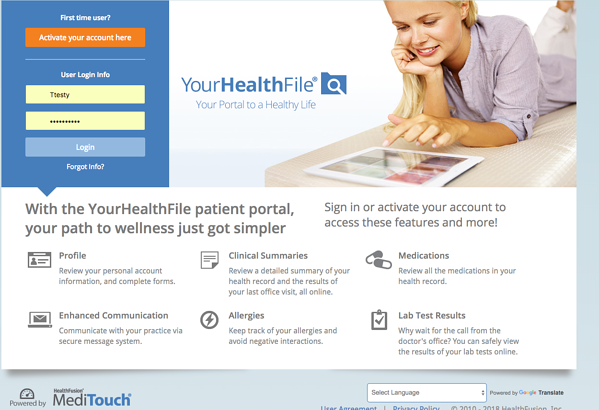 A user friendly, well designed patient portal like YourHealthFile patient portal which is part of the NextGen Office cloud based EHR, will serve your patients and make your office staff and overall practice more efficient. By using an online check-in feature, your front office staff will no longer need to retype the many pages of paper forms that patients typically fill out in the waiting room of your office. NextGen Office YourHealthFile's check-in feature is completely customizable and allows you to select which pages or forms your patients can access in the check-in process, including editable PDFs. If the patient updates their family, medical, surgical or social history or immunizations that information is automatically added to the patient's encounter summary in the EHR. Patients can complete all of their forms conveniently from anywhere they choose, on any computer, their smartphone or tablet. The online self check in process significantly reduces patient waiting time and reduces the time it takes your receptionist to check patients in. Not to mention clearing up the congestion in your waiting room! Self check in via a patient portal will lead to your patients feeling empowered and being engaged in their healthcare - two key factors involved in increasing patient satisfaction. Patients are just like you in that they are busy and short on time, their business day is the same as yours , anything you can do to save them time like allowing to complete your forms online or in the waiting room is appreciated.